How can I make it easier for teachers to learn about the process of teaching and learning with blogs? How can blogging enhance student learning? What are components of QUALITY blogs? How can I guide teachers in experiencing a shift in teaching and learning and help them make a pedagogical commitment to blogging. In Part I, I laid out the importance of READING blogs in order for the teacher to be able to gain and understanding of student blogging as a platform FOR learning, not “just” a vehicle for technology integration. The journey begins with reading blogs, but it has to continue with WRITING. I firmly believe, that an educator who expects his/her students to blog for learning, NEEDS to be blogging for their own learning. My response to the reluctant or scared bloggers, who feel that they have nothing to contribute to the edubloggersphere, is usually that blogging should not be about “others”. Writing a professional blog should foremost be about yourself as a learner and about your own journey. Writing for others might come later down the road. I explored “Who do You write for?” in a previous post. I listed MY reasons for writing. I write for myself, because I enjoy writing. I want to practice writing in order to get better at doing it. I blog because I want to have a record of my thoughts, my learning process, and resources that I find. Seth Godin, in a video, expresses that the METACOGNITION of thinking matters when blogging. It does not matter if anyone reads it. What matters is the humility that comes from writing it. What matters is the metacognition of thinking about what you are going to say. How do you explain yourself […]? How do you force yourself to write in three paragraphs why you did something? How do you respond out loud? The blogger needs to realize that the primary reason for their blogging is NOT to please others, but to be a process that aids in their own learning. “Obvious to You, Amazing to Others” is a short video clip by Derek Sivers that talks about what so many new want-to-be bloggers also feel like in respect to their potential writing contribution to the field. “My ideas are so obvious, I will never be as inventive [as others]… but I continue to do my work, I tell my little tales, I share my point of view, nothing spectacular, just my ordinary thoughts. Obvious to You, Amazing to Others from Plainly Simple Studios on Vimeo. He continues to explain how one day someone emailed him to ask HIM how he ever came up with that genius idea? We need to keep this profound little discovery by Derek Sivers in mind, when we think that we might not have anything to contribute through our writing that would be of interest to others! 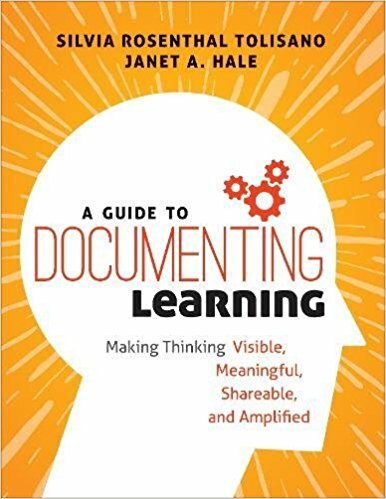 Diving into blogging with our students, it is our hope that they grow as writers, that they connect their learning with new knowledge and that they will be able to express themselves in age appropriate eloquence. 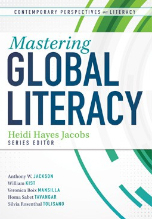 We also acknowledge that looking and preparing our students for their future must include a literacy (of reading and writing) through different media and new genres. If we are in charge of preparing our students, we need to be riding the wave as well. This begs the question, of course, about how much our teachers are writing. Particularly our Language Arts teachers, but really all of our teachers. If it’s so important for our students to write, how come we’re not modeling it? If you are good at it (blogging) someone is going to read it. If you are not good at it and you stick with it, you will get good at it. Writing for your own blog IS NOT like a writing assignment from college. There is pleasure, inspiration and satisfaction to be found in your writing. Give writing another try, without the deadline, performance Angst or grading pressure that used to come with it. Remember you are writing for yourself. You are writing for your own learning journey. So, let’s get down to real life tips to help you write your blog. Keep in mind, that the same basic principles apply when facilitating blogging with your students. Write for yourself first. Blogging is about your own learning. Use it to remember, to document, to follow and refer back to your own journey. Remember that the destination is not always the goal, but that the journey is what you after. No more excuses for not getting started. Find your own: be formal/conversational/narrative/ straight forward in outline form, etc. Experiment with different forms. Connect ideas you read about to your own ideas and thinking (give credit where credit is due of course!). Collect quote and citations you come across, as you read traditional books or during your online reading. See them as puzzle pieces that you assemble during your writing to paint a picture of your point of view. Find ways to add visuals that support your thoughts. Creative Commons images (from Flickr for example) are your best friend. Sometimes a single visual can even spark your writing. Remember to also take your own images( to use in your blog) as you explain the way you see the world. If you enjoy graphic design, consider creating your own visuals as well. Many visual minds learn best by taking an idea or concept apart and by visually re-assembling it. Don’t see blogging as something in addition to what you do. Incorporate, embed, braid it into your work. Need to write a lesson plan? Lay it out via your blog. Explain your rational for choosing certain activities and pedagogy. 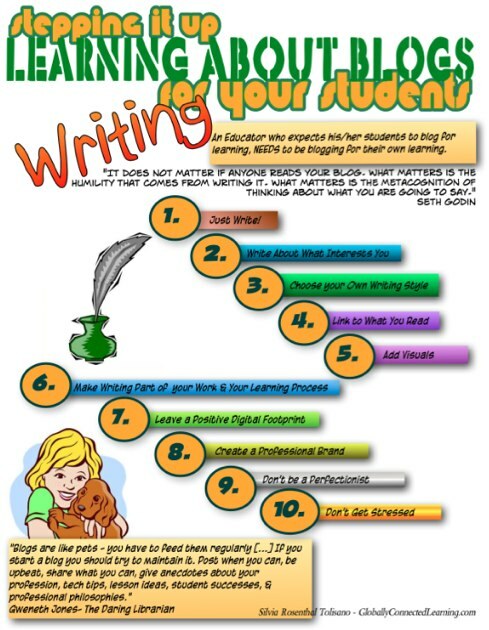 After you taught a lesson, make reflecting (on your blog) part of the lesson planing cycle. Doing research about a certain topic and need resources? Use your blog as the platform where you collect and review the resources you find. What would you like others (colleagues, students, parents, administrators, future employers) to find about you, if they were to google you? The answer to this question can give you ideas about what you could write about as you are starting to share and shape your digital footprint. Brands used to be reserved for companies. Since we have become a “producing” society (not just a consuming one), the concept of branding has spilled over to us “individuals”. Your “brand” represents who you are, your beliefs and points of view across different media and online platforms. The writing on your blog will help define your professional brand. Obviously do your best, but the point is to get it out, to process your thoughts, to formulate your thinking. Don’t spend hours on finding the “perfect” image at the expense of actually writing the post. You don’t/ won’t (most likely) get paid for your blogging, so don’t add unnecessary stress to your life. Work at your own pace. Don’t set yourself deadlines that you won’t meet and only stress you out. You will enjoy your writing much more. Blogs are like pets – you have to feed them regularly […] If you start a blog you should try to maintain it. Post when you can, be upbeat, share what you can, give anecdotes about your profession, tech tips, lesson ideas, student successes, & professional philosophies. Start When You’re Ready, Already! Keep an Idea Folder Going! How can we teach/coach/facilitate blogging and hence writing, if we have not gone through the process ourselves? What is the most important advice you would give a teacher to start blogging/writing? I think the best advice is the one you gave first of all: just write. When I started blogging 2 years ago I had no idea how it would develop or who would read it. I just wrote down my own thoughts so I could mull them over myself. I didn’t think about the style, that evolved. I didn’t think about what I would write about in the future, that just came naturally. Blogging is truly the most important thing I have ever done to make me a better teacher. I am now more thoughtful and mindful about what I am doing and why. For me reading other educators’ blogs definitely came first. I think I used Twitter and Google Reader to find and read a couple of blog post every day. At this point I didn’t even think of writing a blog myself, but I simply devoured what others were writing about. It was when my job changed from a fixed schedule to a flexible one that I started blogging and in the beginning it was just for me. I wanted to document a few things I was doing and how this was impacting student learning. I wanted a place where I could question and wonder and mull things over. What actually happened was that I connected with others and they helped me answer some of my questions and gave me even more to think about! It hasn’t always been easy. I’m working in a school where it’s not good to question and I’ve been actively discouraged from writing. On the other hand thousands of educators around the world have given me support and this has kept me going. In fact this support has enabled me to decide to move on from my current school and look for one that is more supportive. I work with teachers interested in a ‘whole brain’ approach to learning. Applying these concepts to blogging, I think it’s beneficial to consider that there will never be a one-size-fits-all reason for anyone to blog. Their motivation will come from their own mental makeup. For instance, the analytical thinking teacher will blog in order to display their competence, perhaps in order to enhance their credibility. They will need to perceive a clear benefit from blogging which will justify the time and energy. The conceptual thinking teacher will treat blogging as an opportunity to exercise imagination and vision. They might be more comfortable creating videos and graphics for their blog instead of writing. And the social thinking teacher will want to make sure their writing is being read and enjoyed by others, so daily interaction will be prime motivator (which might make things like Facebook and Twitter more attractive alternatives). I would think that presenting the benefits of blogging across the whole ‘brain spectrum’ will give everyone something to connect with. I want to start by saying thank you for creating such a thoughtful and honest reflection of how to get started with writing on blogs. Maybe people believe they can’t do it, therefore never try which in turn takes away from their students opportunity to learn. Your post comes at a critical time in my own blogging experience. I am currently working on my masters in elementary education and my first course is a technology course looking at exploring Web 2.0 tools. Our group discussion this week focuses on the stages and progression one goes through in the blogging world, from simple to real to complex (Richardson, 2010). Your post is timely because many of my class mates feel frustrated by the blogging process, they don’t feel they have anything to share (I loved Derek Shivers video). I often feel this way, but I’m learning that others feel this way too. I’m slowly evolving into a blogger. I began this journey a year ago because I wanted to improve my writing and I knew I had ideas to share with others. 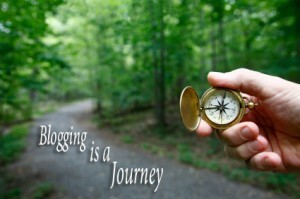 Blogging is a perfect outlet for reflective thinking. There is so much to learn about blogging, writing, technology, math, etc (just a few of my passions). They also feel they are not reflective enough. Your post gives them permission to just write. It’s okay to make mistakes and not be the best at blogging, the point is to try. You have provided valuable advice and insight for teachers to consider for themselves. Once they start on this amazing journey of discovery and learning they will hopefully allow students the opportunity to reflect as they do. 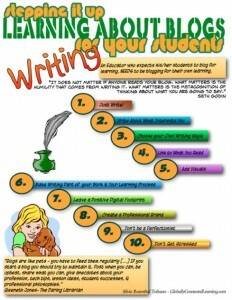 I can not wait to read your third post on how to help students to blog. Pingback: This is why I am starting this… « TESTING. TESTING. My name is Holly Fore and I am a Elementary Education student at the University of South Alabama. I would like to say thank you for writing this thoughtful article. I am so glad I was assigned to reading this because the one thing I really want to do with my class is make a class blog. I really need to read this. This is very helpful! Thanks.